A Rice University study has found that the aspirin-like drug diflunisal blocks the action of prestin, a key protein that is required for hearing. The research, which is available online in the open-access journal PLOS ONE, stemmed from a 2015 Rice study that screened more than a half-dozen nonsteroidal anti-inflammatory drugs, or NSAIDs, for possible interactions with the protein prestin. Prestin is a highly specialized protein that drives the action of outer hair cells in the cochlea, an inner-ear organ that allows people and animals to hear. "Taking too much aspirin can cause temporary deafness, and researchers discovered more than a decade ago that this happens because salicylate, one of the primary metabolites of aspirin, interferes with prestin," said study lead author Guillaume Duret, a research scientist in Rice's Department of Electrical and Computer Engineering. "Given the number of commonly used NSAIDs that operate in a similar way to aspirin, it seemed like a good idea to find out whether they also might inhibit prestin." Duret said diflunisal was the only drug in the test that blocked the action of prestin. He said the findings suggest that the inhibition occurs by competing with chloride ions in prestin, a mechanism that is similar to what has been proposed for salicylate. The study also found that the dosage needed to induce a reaction was less than the aspirin dose required to induce a similar reaction. Diflunisal is primarily prescribed as a mild pain killer and an anti-inflammatory for arthritis. But Duret said the findings come at an important time because the medical community is considering repurposing diflunisal as a possible treatment for both cancer and amyloid polyneuropathy. "So far, it's been used in a pill form that is ingested, and the known side effects are for relatively small doses, like as if you were taking aspirin," Duret said. "For greater doses that are perhaps injected, the side effects may not yet be known." 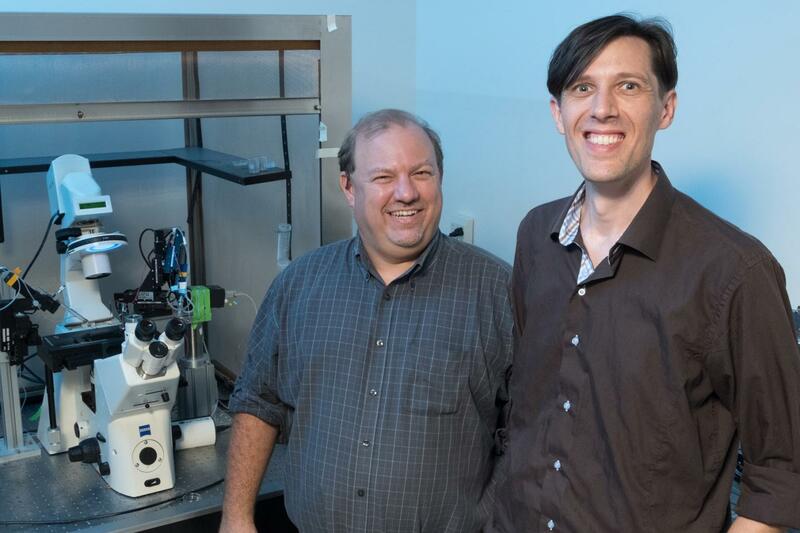 He conducted the study's experiments in 2015 with two of the world's leading experts on prestin and outer hair cells, Rice bioengineer Rob Raphael and Baylor College of Medicine molecular biologist Fred Pereira. The new findings weren't easy to obtain. They involved dozens of painstaking experiments in which Duret isolated and measured the activity of live outer hair cells from the cochlea of mice. To get his measurements, Duret had to find the cells under a microscope, grab hold of them with a glass pipette and apply and measure current through a process known as whole-cell patch clamping. The tests had to be performed both with and without the presence of diflunisal and before the short-lived cells died. Raphael, who has studied prestin for more than 15 years and who made some of the first discoveries about salicylate's interference with prestin, said live-animal testing is needed to determine whether diflunisal causes deafness and at what dose. "In addition to the potential clinical significance, Guillame's carefully done research has helped us refine our understanding of how molecules interact with prestin and how prestin itself operates," Raphael said. He said the study also revealed a direct effect of diflunisal on the hair cell membrane, a result that may have implications for other physiological systems. "This study comes at a time where there is considerable excitement about new fields like systems and synthetic biology," said Raphael, who's lab is developing systems-level models of ion transport in the cochlea. "This is a reminder that we still don't have a basic understanding of how commonly used drugs affect important proteins in our cell membranes," he said. "Sometimes, even the discoveries in your own lab humble you to the magnitude of what we still do not know about biological systems."